As of March 20, 2019 We have 45 Steinway Grands in Stock. Play 25 B's. Choose the one that touches you !!!!! No Sales Tax except in Texas. Experience the most personalized service in the business and the BEST Steinway B’s. Concert Pianos, a Red Bird LLC Company is exclusively devoted to the Steinway Market. 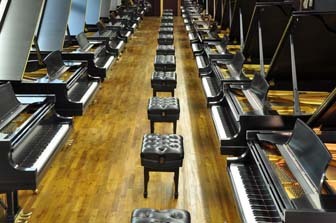 We specialize in Steinway Grands and have the largest selection of Steinway Model B's in the US. Experience what it is like to have a private appointment with 8 Used Preium Pre Owned Steinway Model B's to choose from, just, in our Dallas, Texas Location. Maestro Bruno will host you during a private selection day. He is a pianist and has sold Steinway new and used for over 43 years. Trust an expert and a pianist. Contact us to find the right piano for your institution or for your personal use. This enables us to accomidate any price range.